"The bank will address challenges that have hampered agriculture such as lack of financial packages. Different financial packages will suit different categories of farmers," announced Tanzania's President, Jakaya Kikwete, during the launch ceremony of the bank. The Tanzania Agricultural Development Bank (TADB) will receive US$48mn every year for eight years from the government so that its 20-year strategic plan can be implemented. President Kikwete urged farmers to utilise the loans to be offered by the bank to improve their agricultural productivity. TADB will work with commercial and community banks, savings and credit cooperative societies to extend loans to farmers. Individuals can also access loans directly. Small and medium farming outfits involved in maize, rice, fruit, sugarcane, horticulture, livestock and fish farming will be given priority. Bee keepers and farmers raising indigenous chicken will also benefit from TADB. Farming in Tanzania is dominated by smallholder farmers, with the average farm size being between 0.9 ha and three hectares. 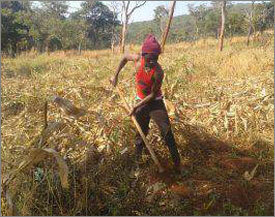 These smallholder farmers collectively cultivate 5.1mn ha of which 85 per cent is used for growing food crops. Inadequate funding, poor farming methods and over-reliance on rain-fed agriculture has affected productivity, according to TanzaniaInvest.com. Under-investment in agriculture has limited the area under irrigation. While the country has a potential of one million hectares of irrigable land, only 150,000 ha is currently being utilised.